Solaris Plus 709 Tungsten offers the most options in any one device by including patented 3-Frequency Ultrasound, 7 Stim waveforms, and the option of adding Tri-Wave Light Therapy. Exclusive Target and Target Sweep are still standard, allowing interferential treatment to be moved directly over the center of interference. Power and Flexibility Solaris delivers 7 Stim waveforms including IFC, Premod, Biphasic, Russian, High Volt, Microcurrent, Direct Current, and Fixed Frequency IFC/Premod. In addition, Solaris Plus offers 3-Frequency Ultrasound and the new Tri-Wave Light Therapy. 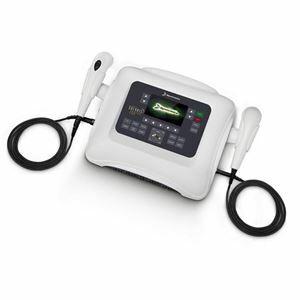 Best of all, Solaris Plus 709 Tungsten has the power to deliver up to 5 channels of Stim, Ultrasound, and Tri-Wave Light Therapy through both Probe and Pads, all at the same time. Introducing Tri-Wave Light Deliver any combination of 3 wavelengths of light (red, infrared, and blue) using the Tri-Wave Light Probe or 2 robust 5” x 7” Tri-Wave Light Pads. Dual Light Pads allow for greater coverage of a joint, treatment of 2 separate areas simultaneously, and the ability to treat large areas of the body when placed side by side. The Dynatronics ThermoStim Probe™, an optional accessory to our new Solaris Tungsten, allows a practitioner to deliver heat or cold therapy in combination with electrical stimulation—AT THE SAME TIME—significantly reducing the time typically required to administer separate treatments. 2 Year Warranty Parts & Labor Included Accessories Qty. Description: 1 Sound head 5cm2 1 Power Cord (black) 1 Operator’s Manual on CD 1 Protocol Reference Manual for Electrotherapy & Ultrasound 1 bottle of ultrasound gel 2 92” double leads 2 92” double leads 1 COMBO plus lead wires 1 Ultra Polys™ Self-adhesive electrodes 2” x 4” w/pin connector (pkg. of 4) Optional accessories 2 cm2 soundhead, 10 cm2 sound head, Multistim probe,Tri-Light Probes, Tri-Wave Pads, and Solaris Cart.